I live in Orland Park, Illinois and I graduated from the Illinois Mathematics and Science Academy this spring. I've developed a love for mathematics, generally leaning toward pure and theoretical studies rather than applications to the real world. I enjoy reading various books and mangas/manhwas, and my favorite book is Ender's Game. Also, I enjoy solving various Rubik's puzzles and video games. Otherwise, soccer, swimming, and skiing are my favorite sports, and I also enjoy the occasional jogging or biking session. E-D Proofs are some of the most basic building blocks of analysis, and many definitions are defined in terms of Es and Ds. Generally, these proofs are for limits of sequences and functions, which then builds into continuity and differentiability. They are so useful because they deal with arbitrarily small values. 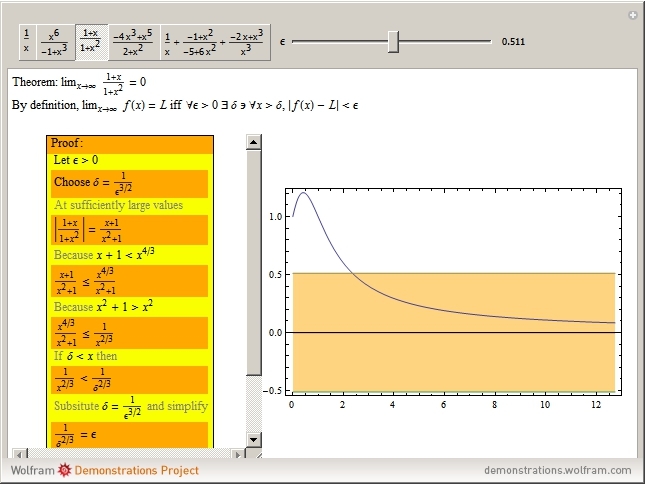 In this Demonstration, there are several functions available, and a proof is developed for each and then explained with reasoning. Also, a visualization of what the proof means is included. The plot shows the actual concept of the proof and what we are trying to show.